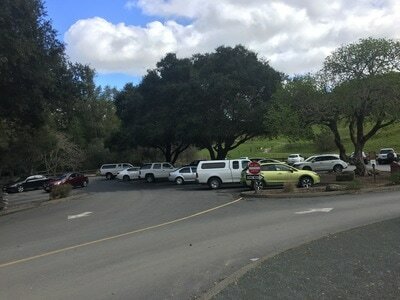 Parking: Free parking lot at the addresses above. 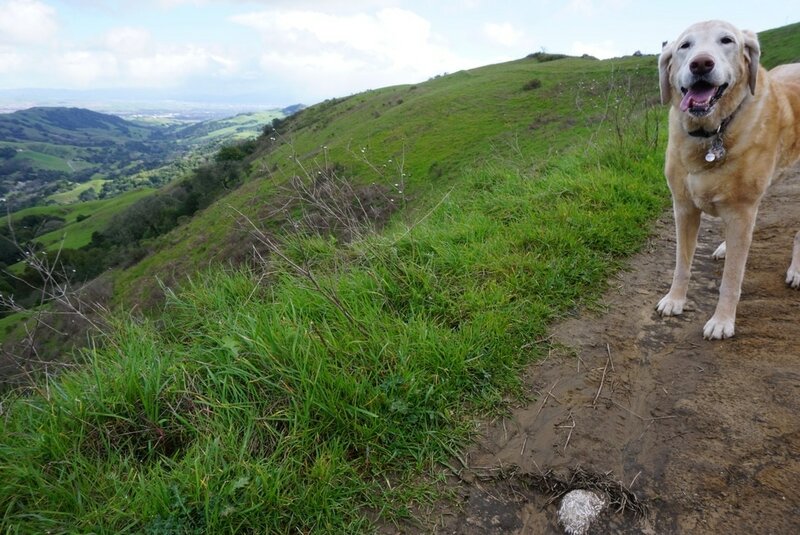 Warning: Watch for grazing cattle on trails and keep a close eye on your dog. 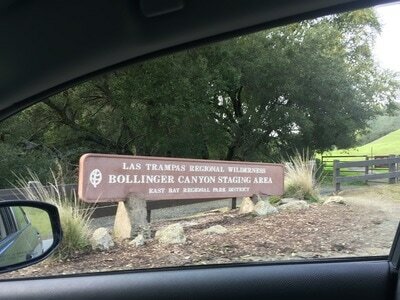 Bollinger Creek Loop Trail south of the equestrian parking area is closed indefinitely. 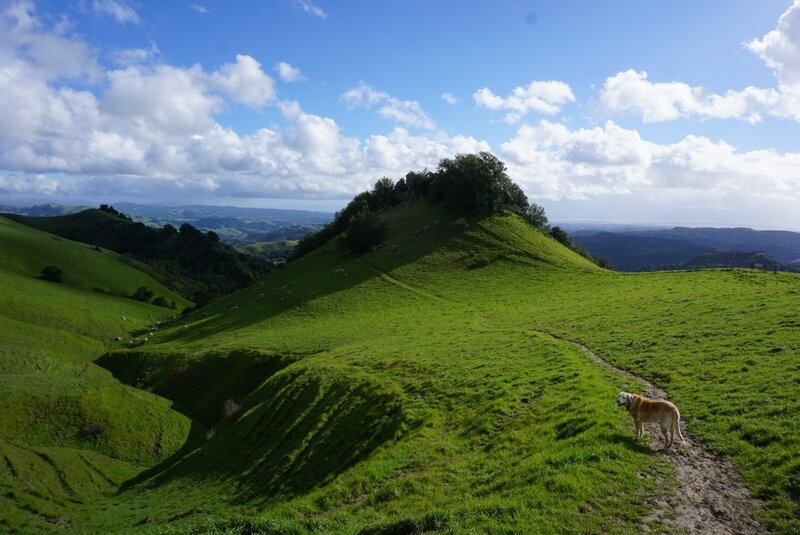 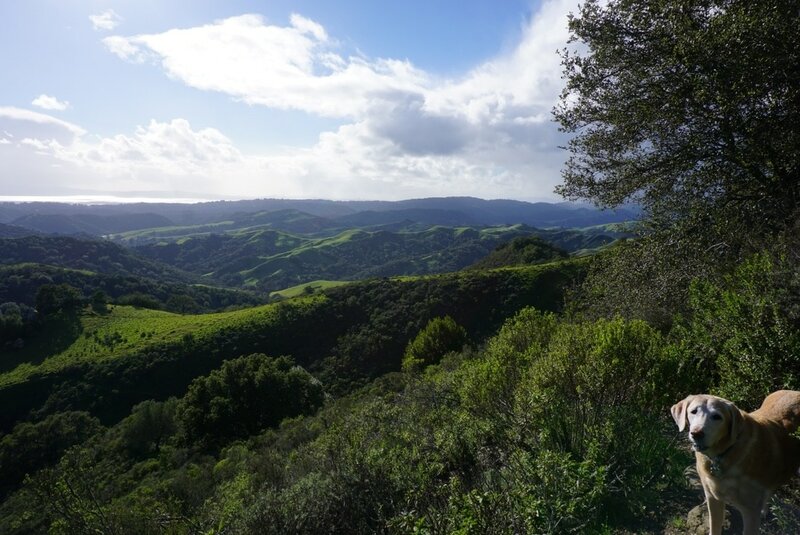 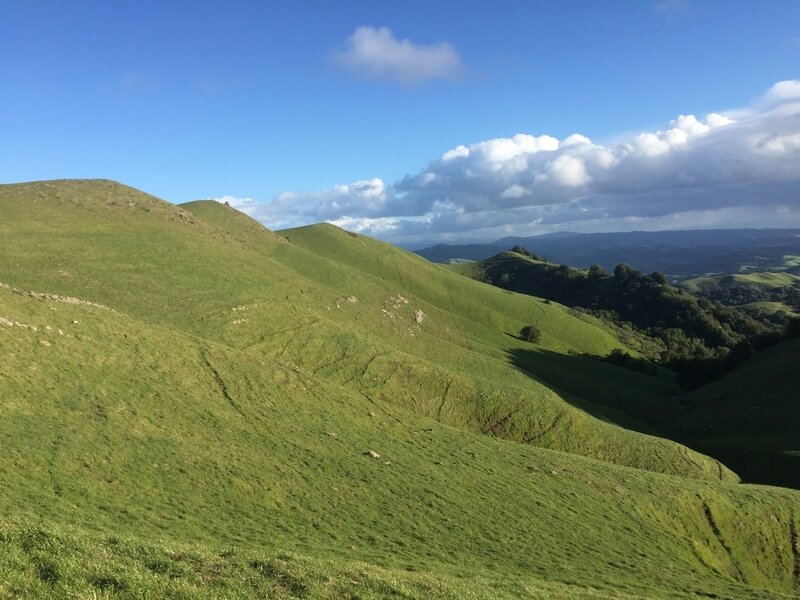 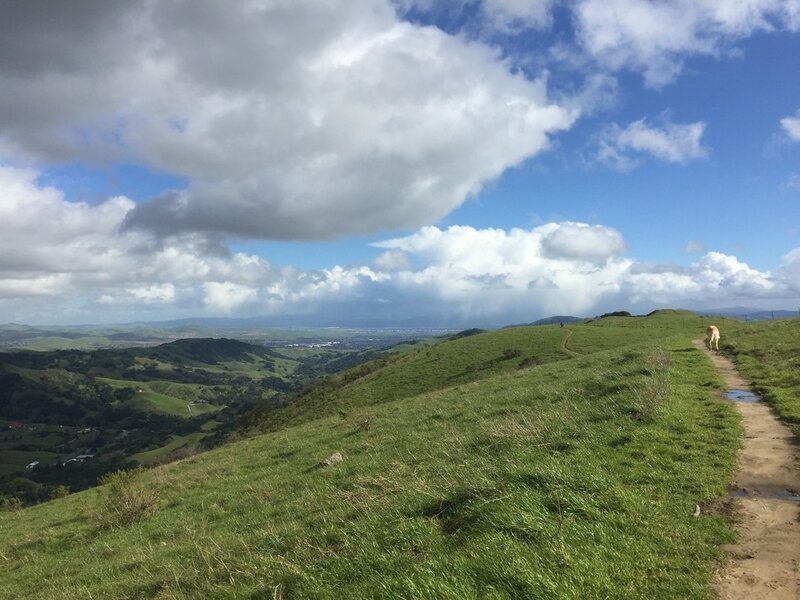 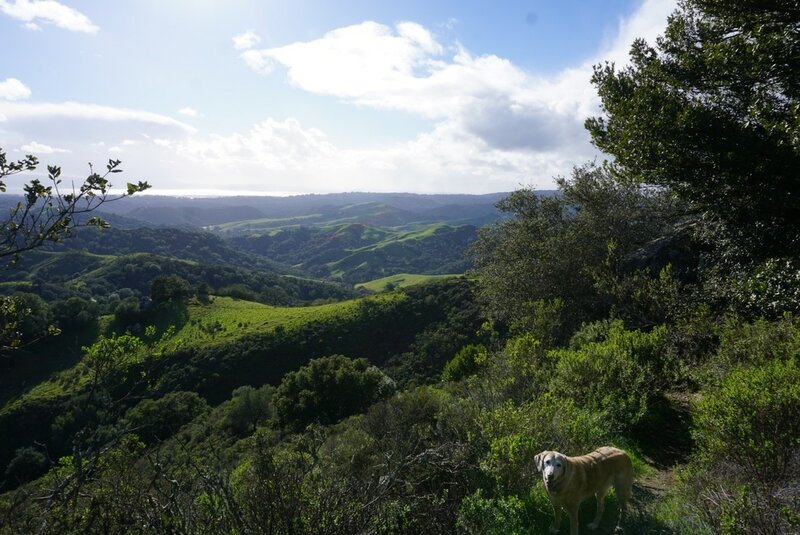 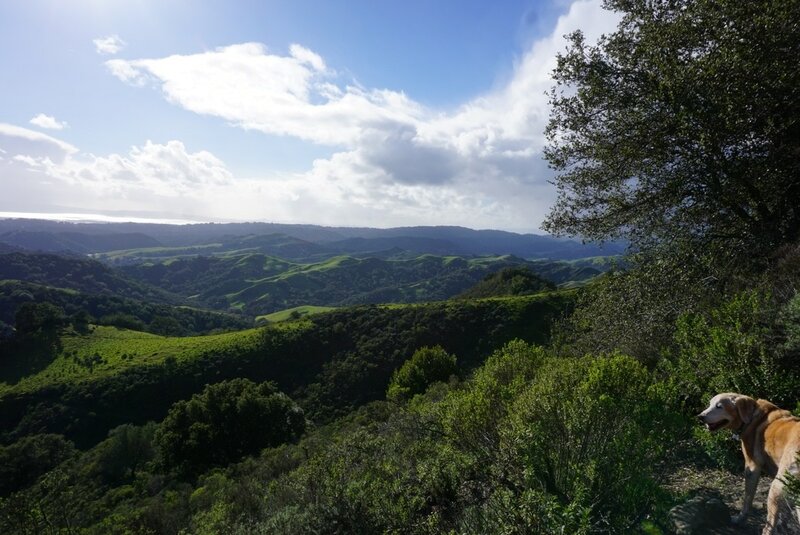 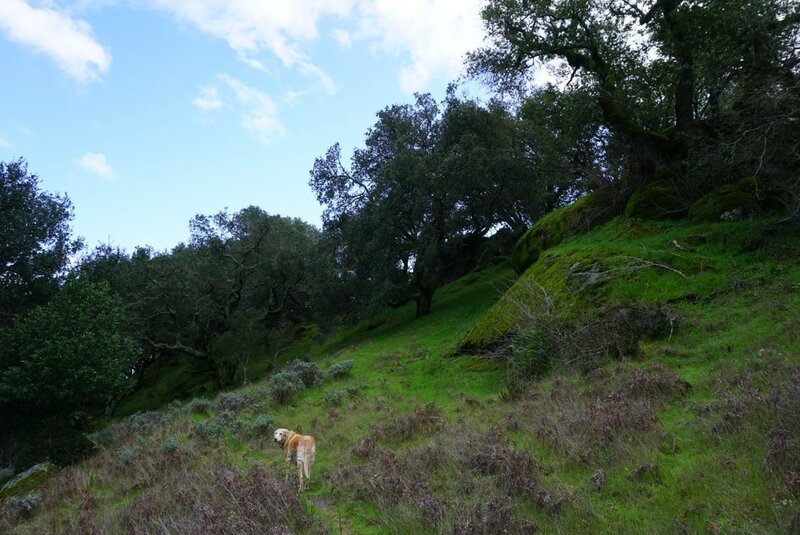 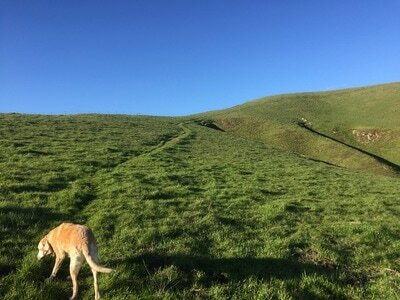 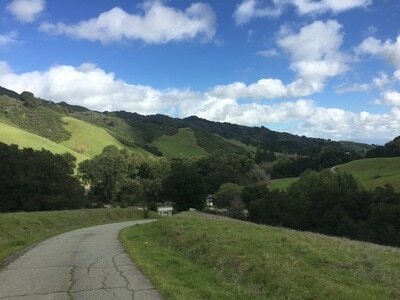 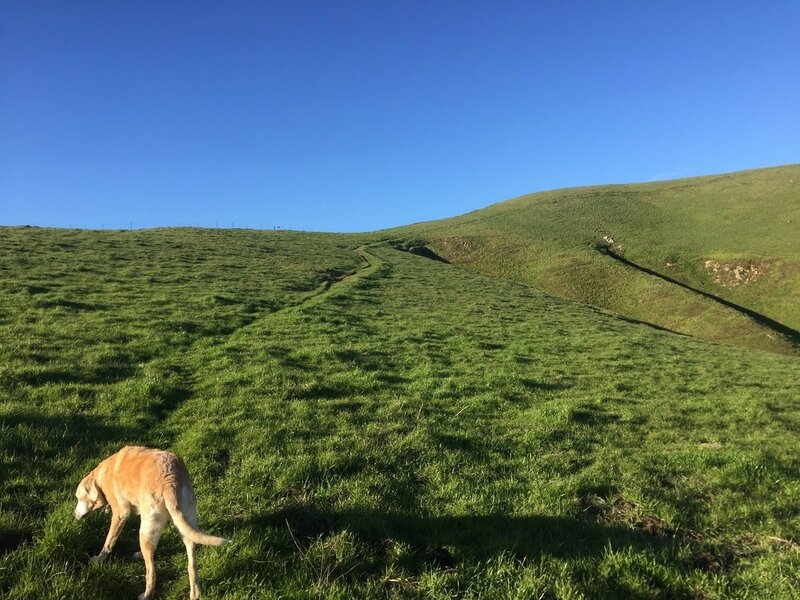 Description: Hike 5,342 acres of open space with diverse trails that range from shady canyons along the creek to strenuous ridge top trails with panoramic views. 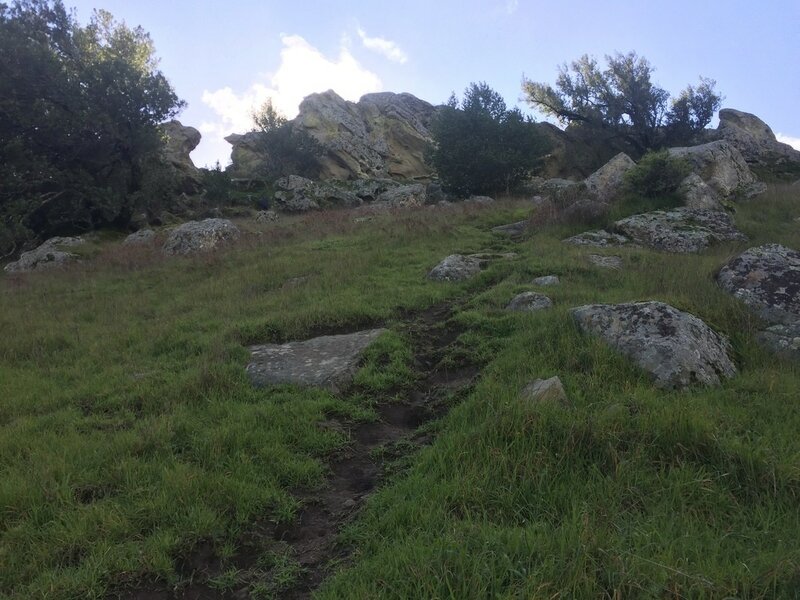 Although there are a few easy trails near the parking lot, if you want to hike any kind of distance you'll be in for some steep treks. However, these are totally worth it for the incredible views. 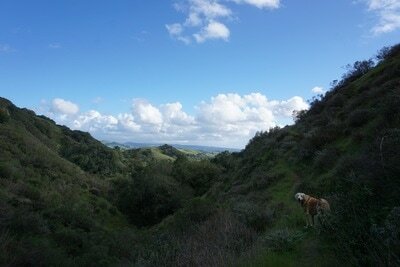 During our hike, we took Rocky Ridge Trail, which heads up through the cattle gate from the parking lot. 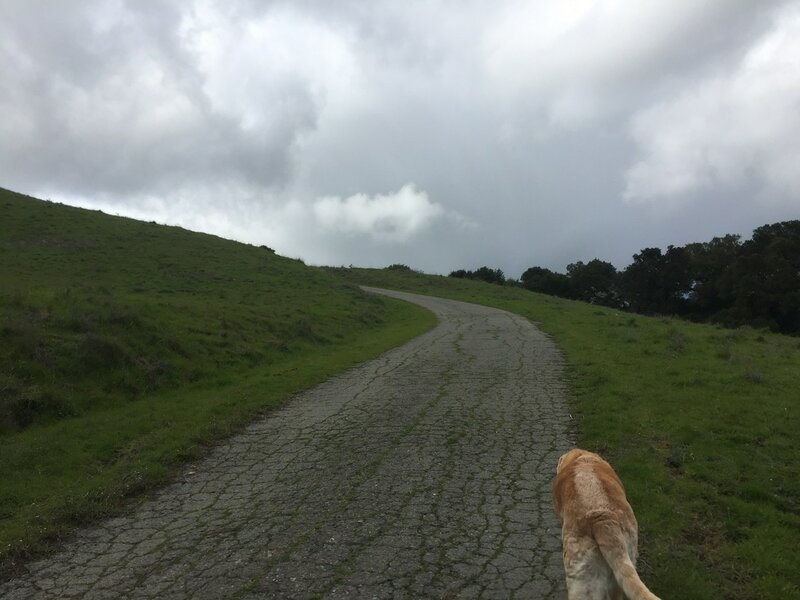 The beginning is paved, but it immediately starts you off with a moderate climb. 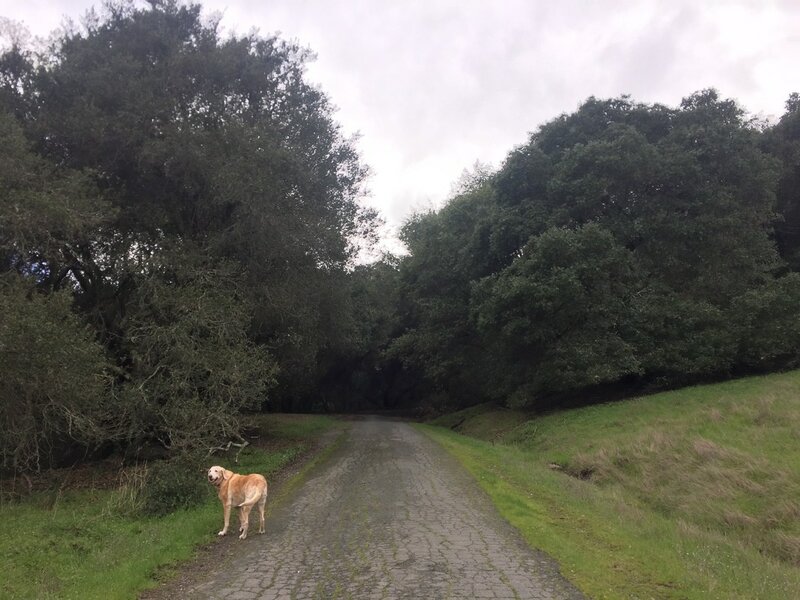 There were oak and bay trees on either side of the trail, and you could hear the stream, which cascaded down in some sections. Soon we saw a lone cow about a hundred feet from the trail, but it didn't even acknowledge us. This is the only cow we saw during our hike. 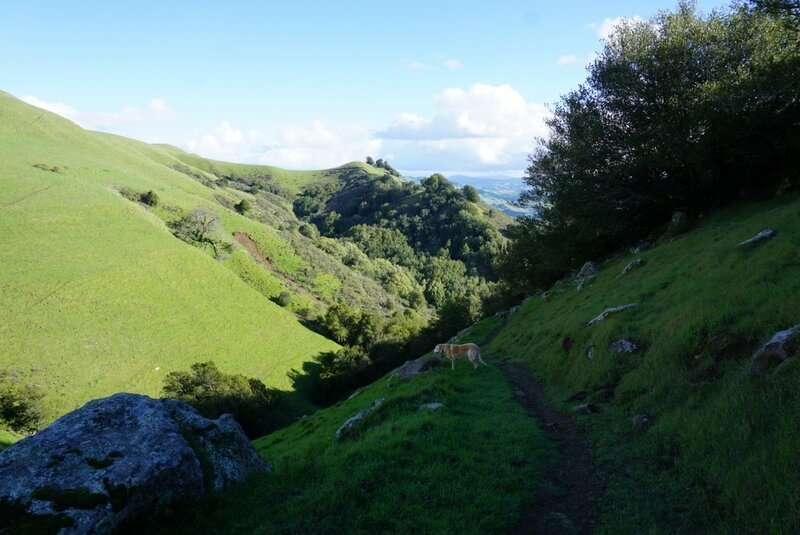 Rocky Ridge Trail soon splits off the paved trail via a dirt trail to the left which has a trailhead marker for Rocky Ridge and Cuesta trails. 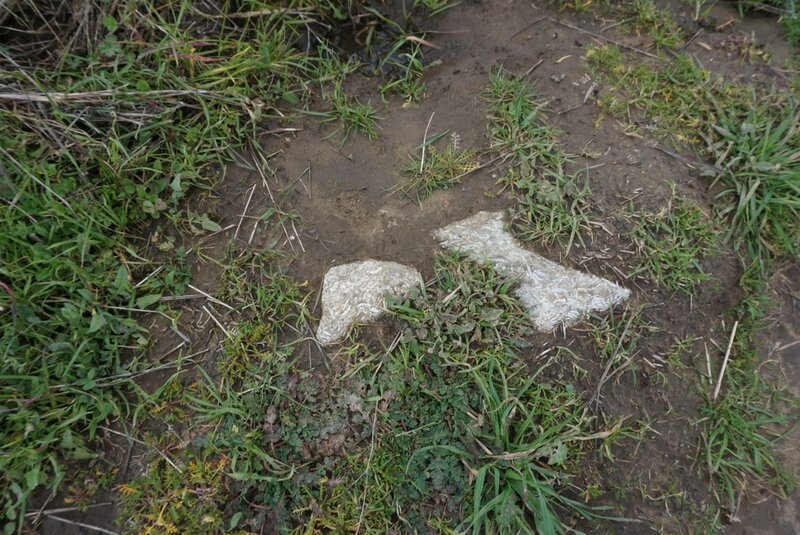 The paved trail will also meet the top, but it has encountered some storm damage and crumbled in one section. 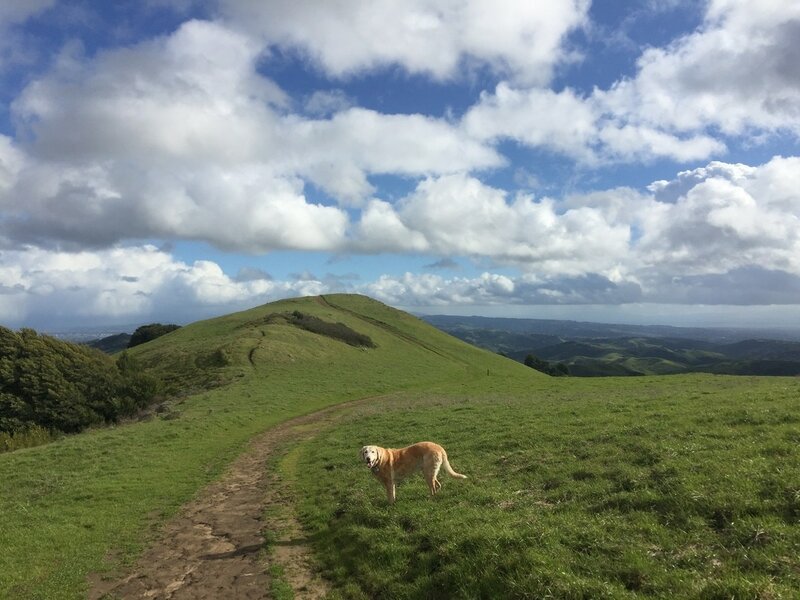 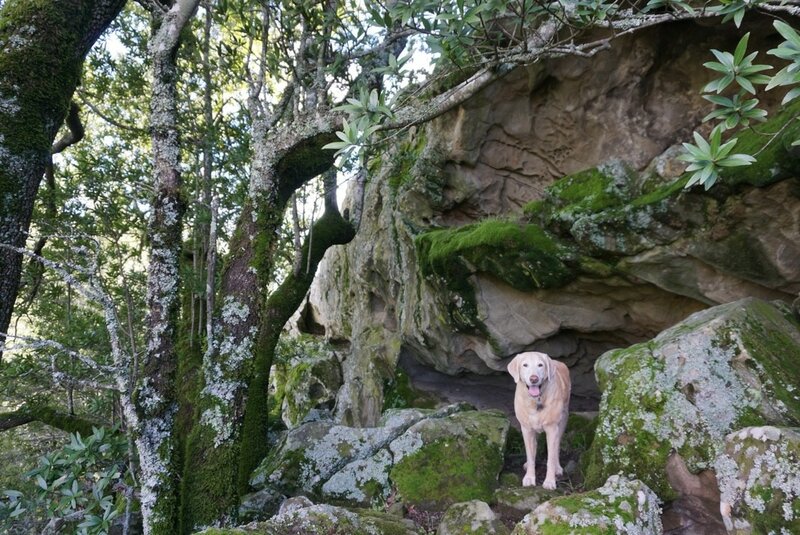 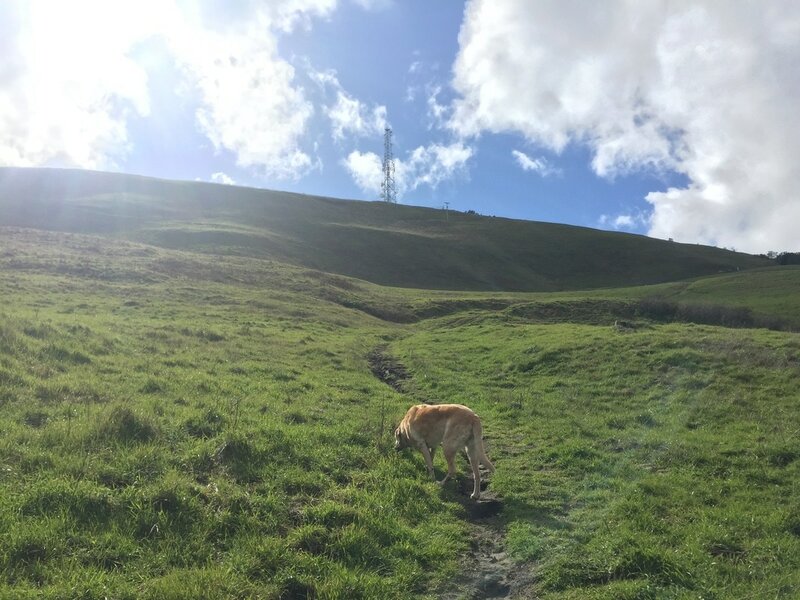 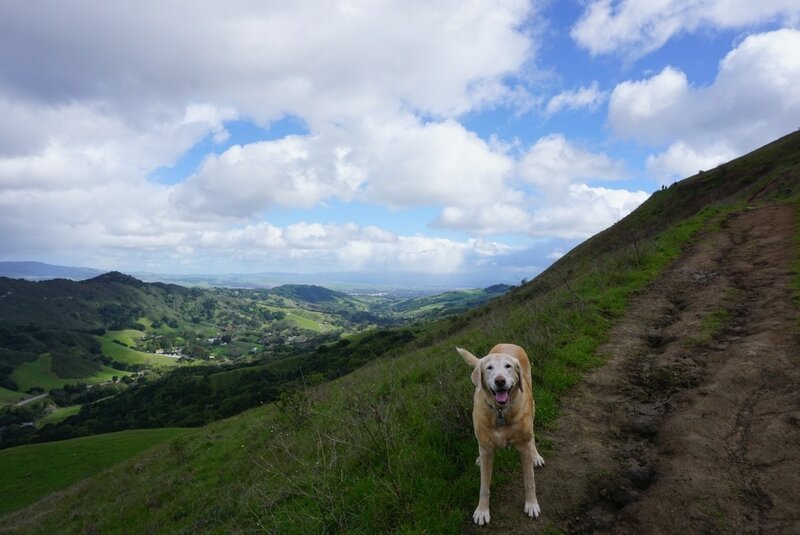 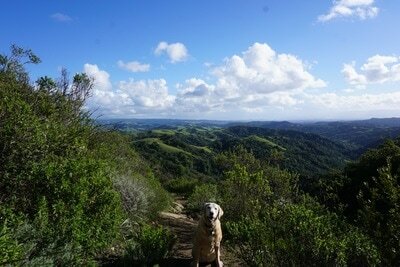 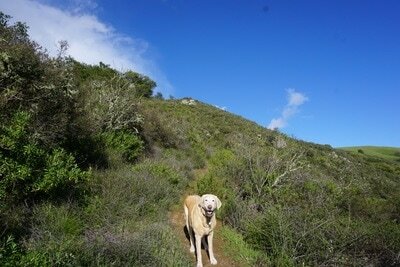 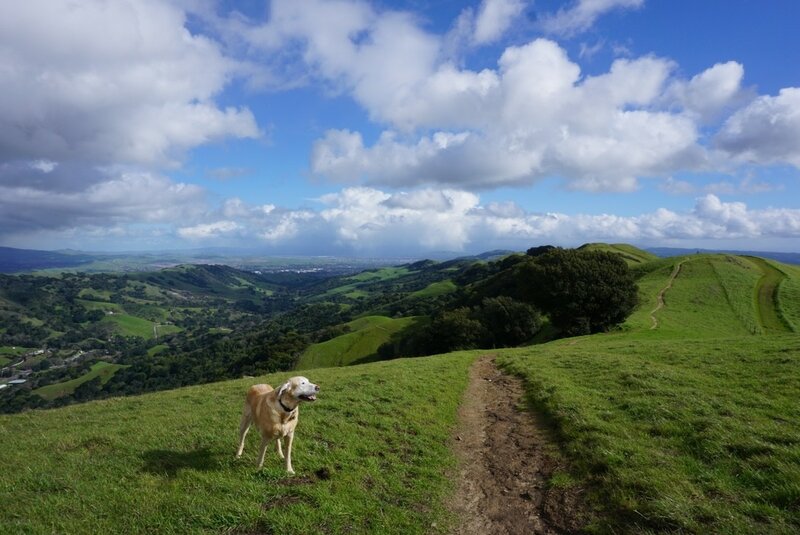 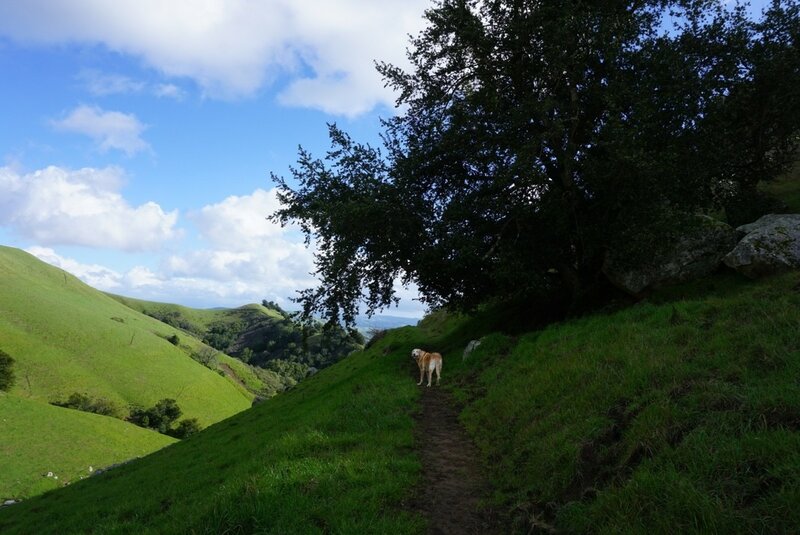 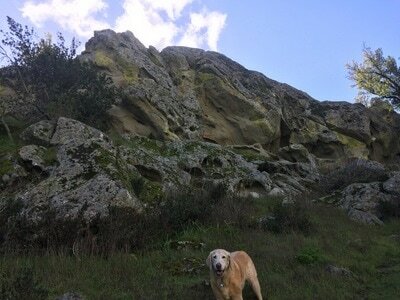 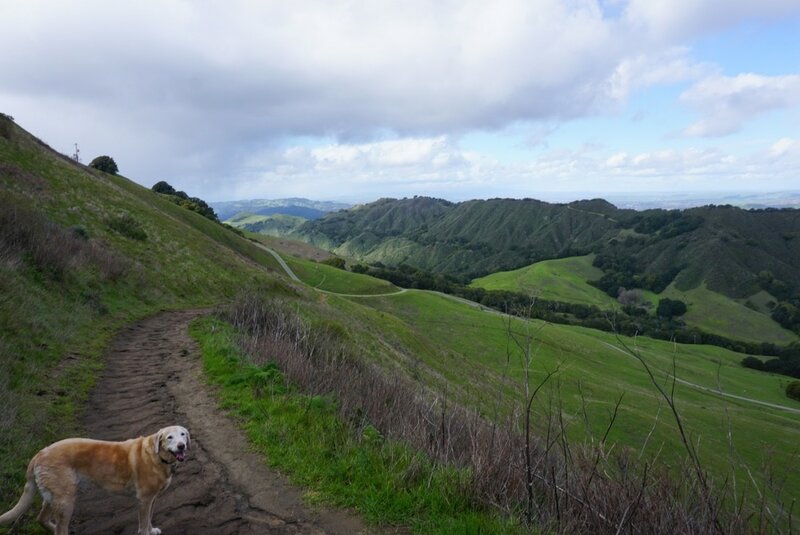 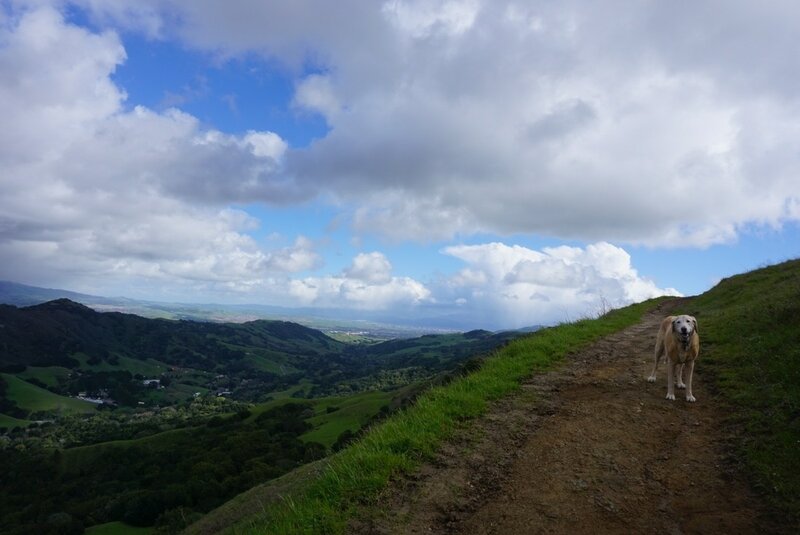 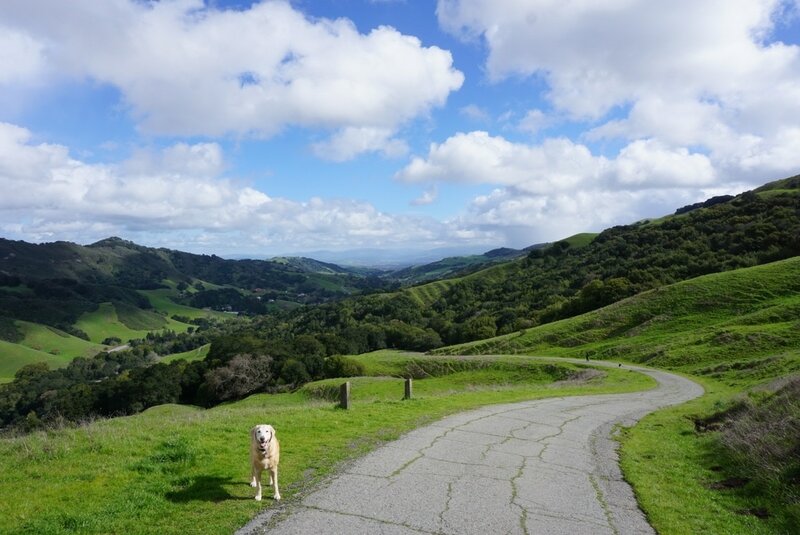 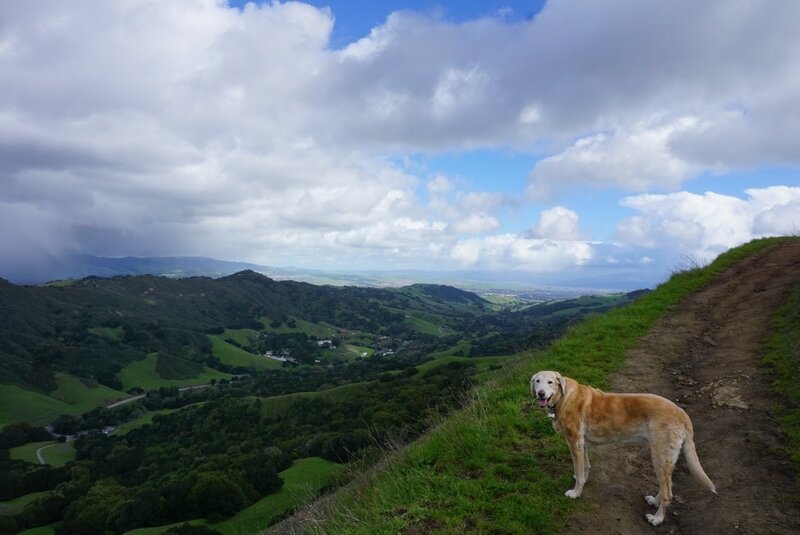 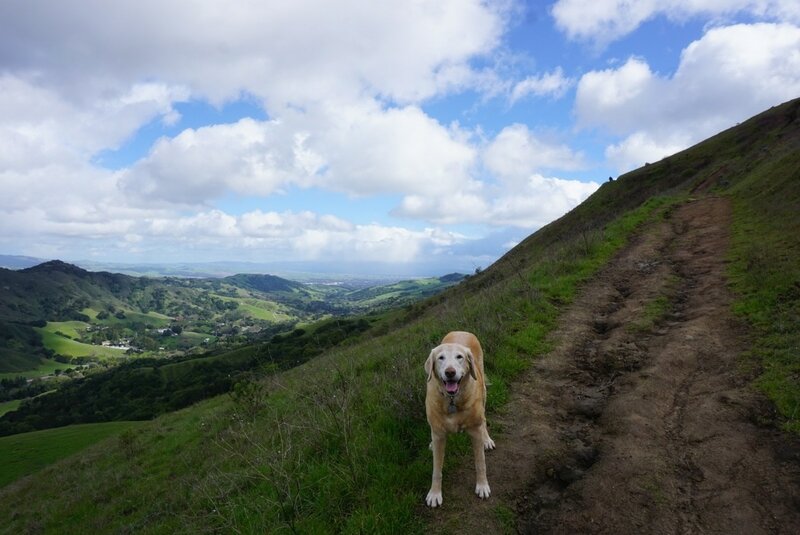 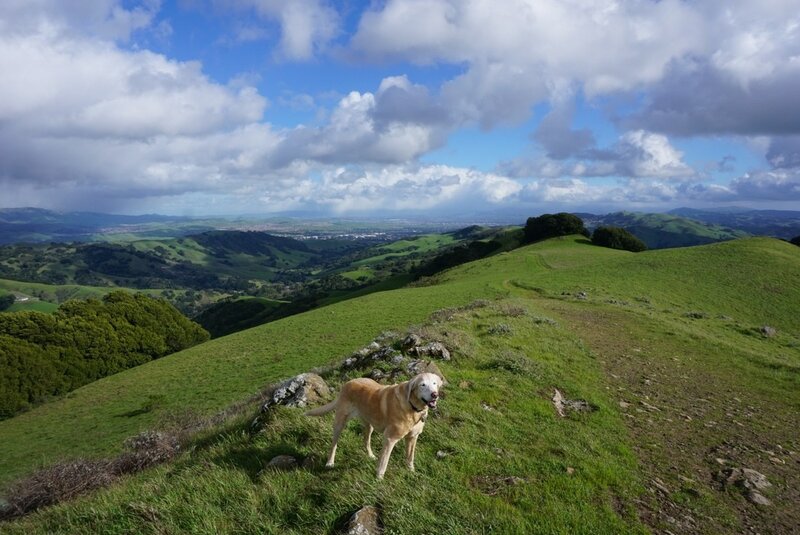 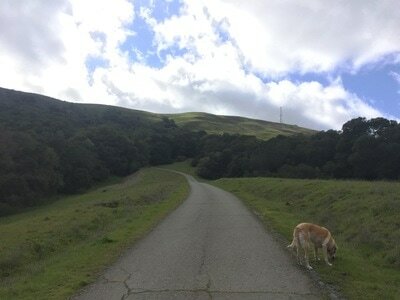 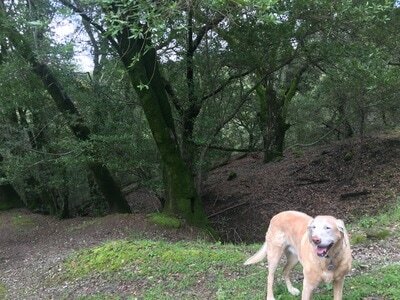 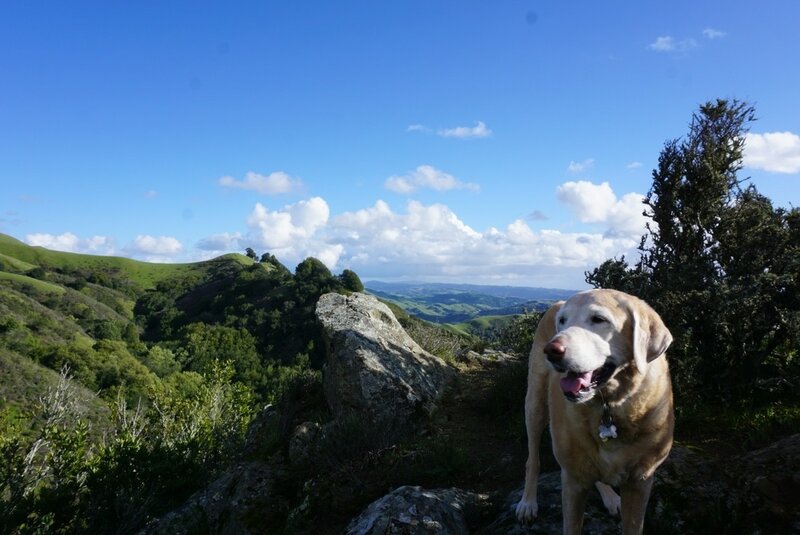 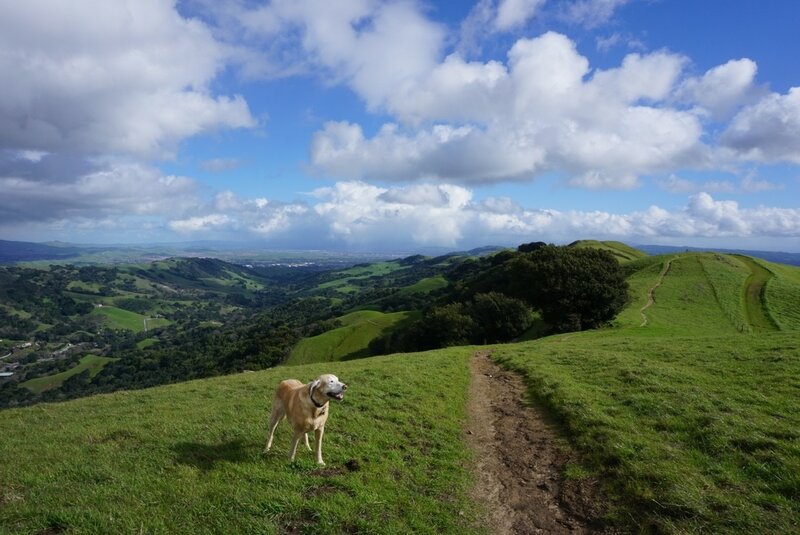 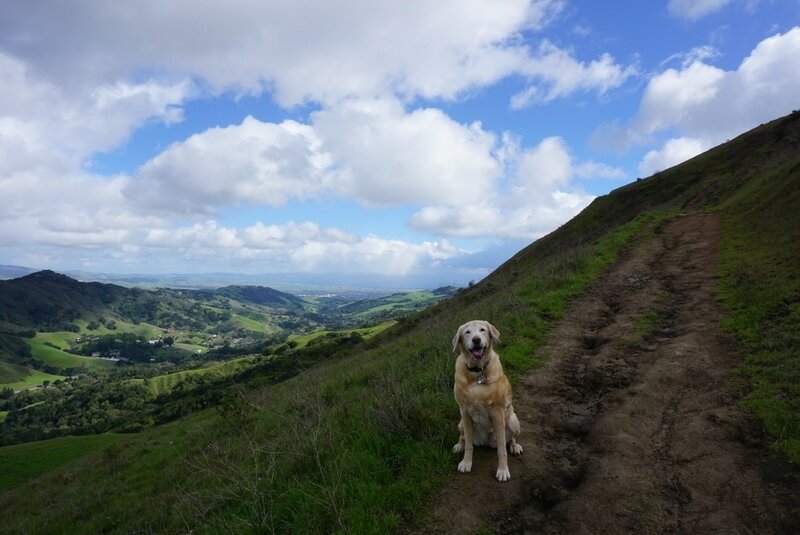 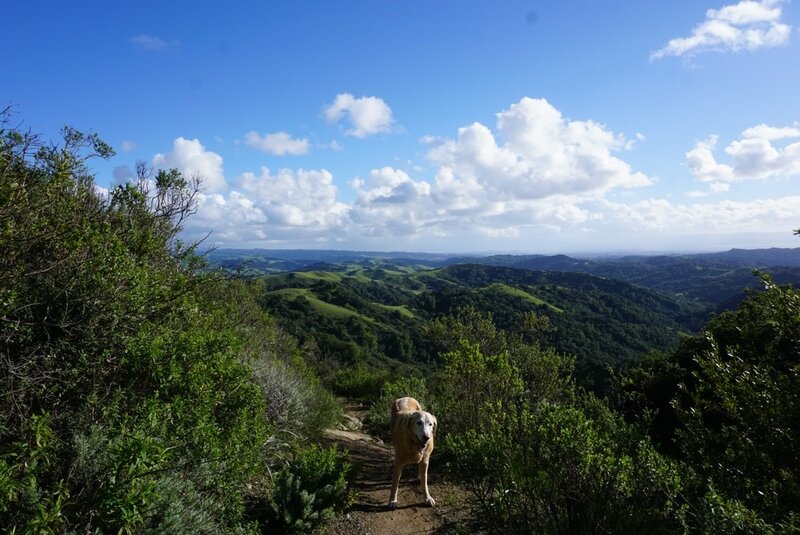 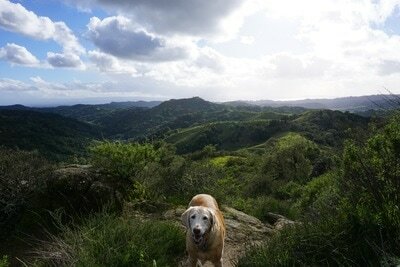 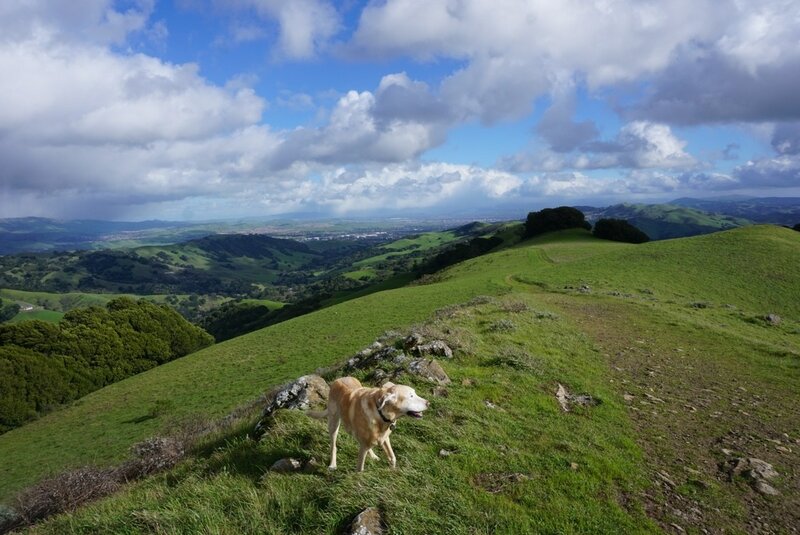 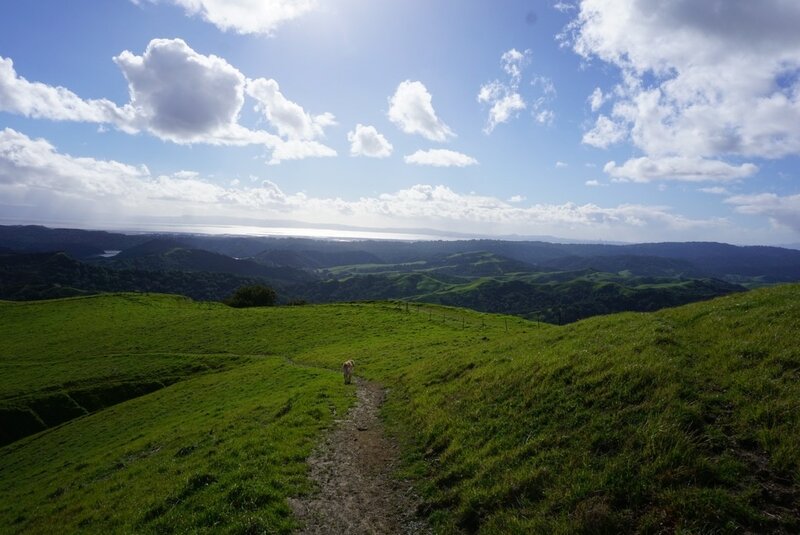 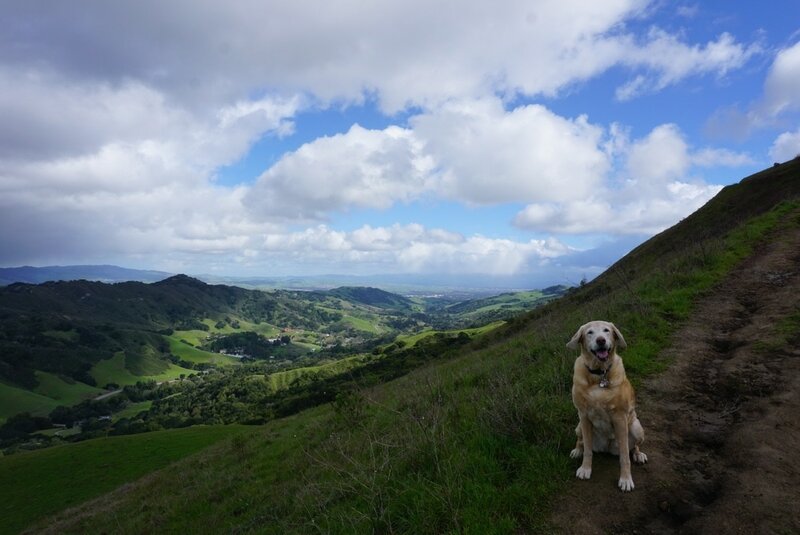 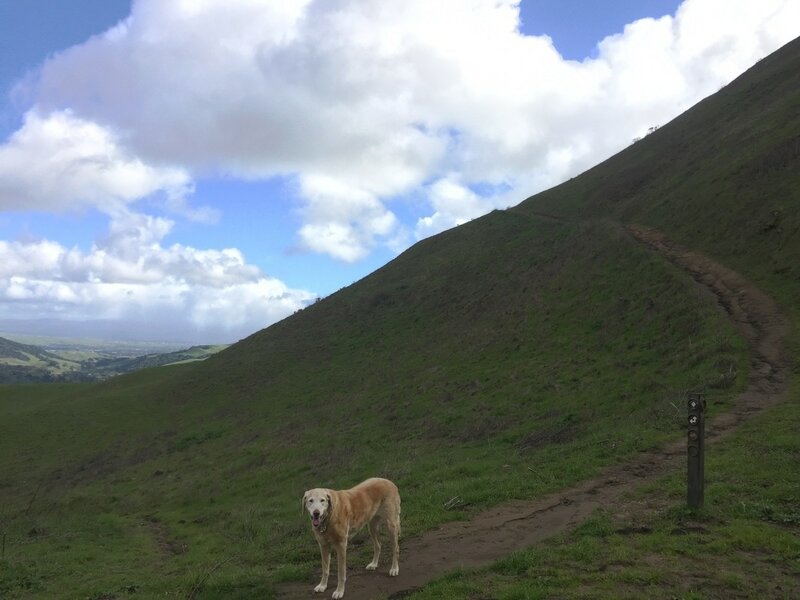 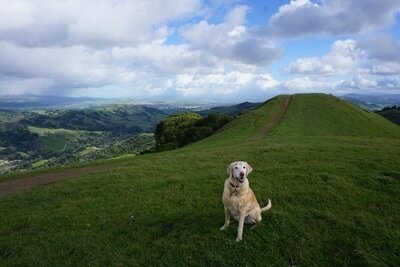 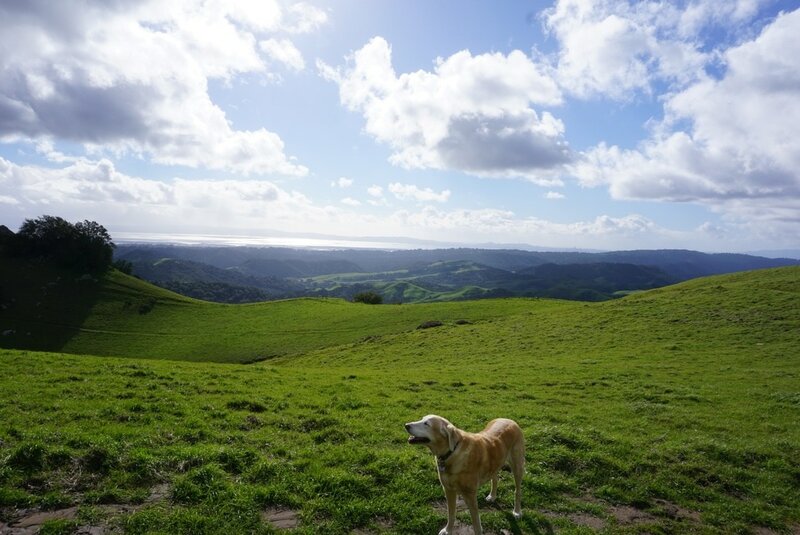 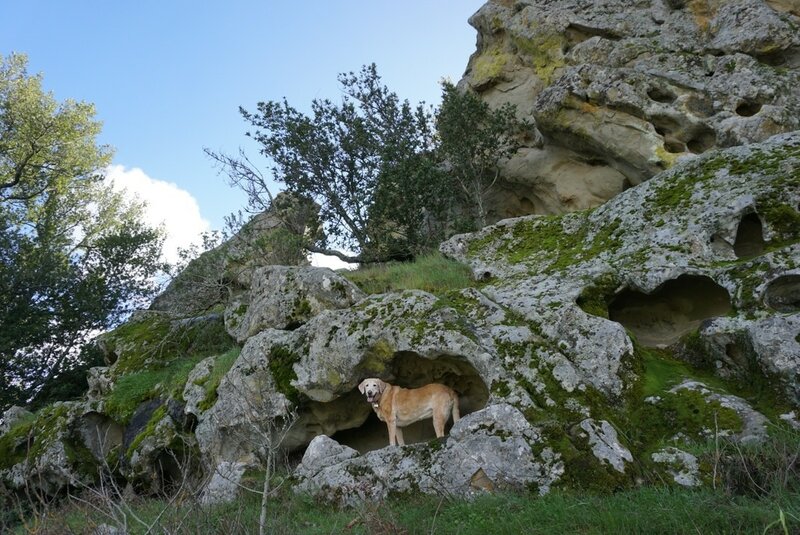 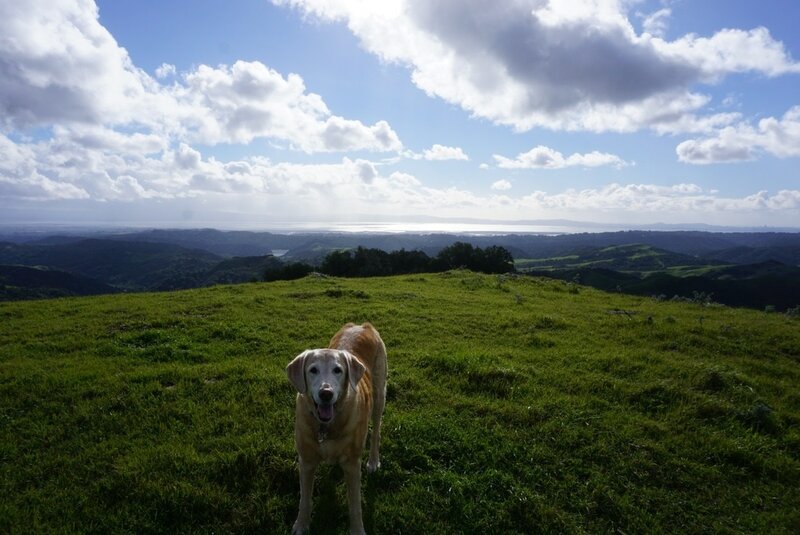 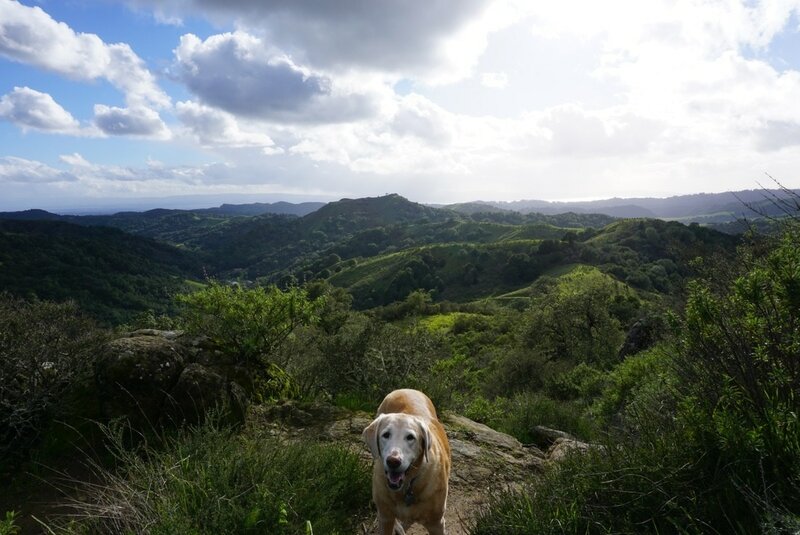 When you reach the top, you'll notice an EBMUD gate to your right; unfortunately the EBMUD land is not dog-friendly here. 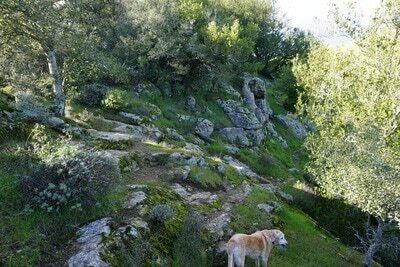 We continued up and to the left via Rocky Ridge, which narrows and continues a steep climb. 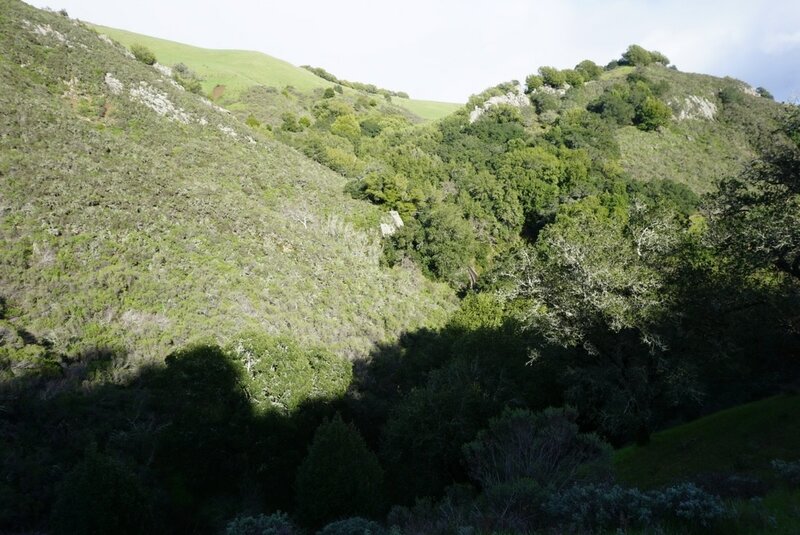 It levels off a bit towards the top, following the EBMUD boundary. 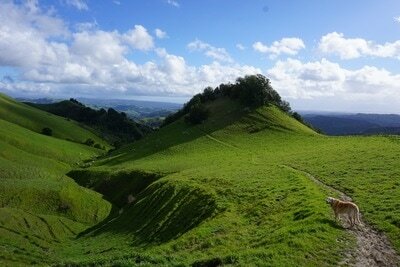 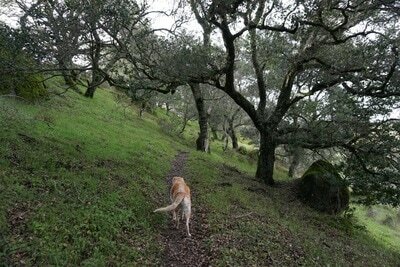 We continued straight ahead as the trail widened and continued over small hills. 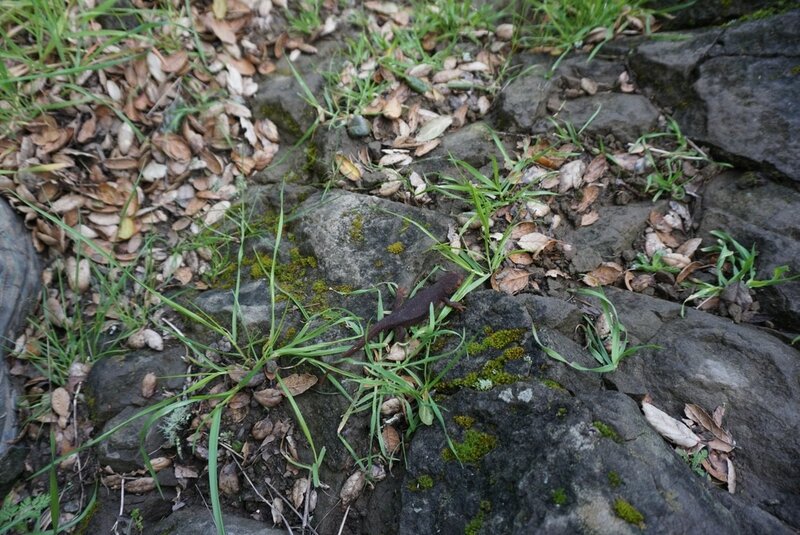 If you look down you'll notice quite a few dark rocks speckled with white shells, which are fossil rocks that emerged from the fault line. This trail is incredibly scenic with panoramic views of the hills and city below. 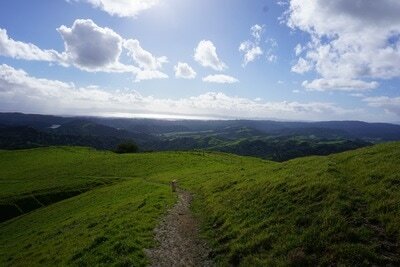 You'll even glimpse San Francisco to your right. 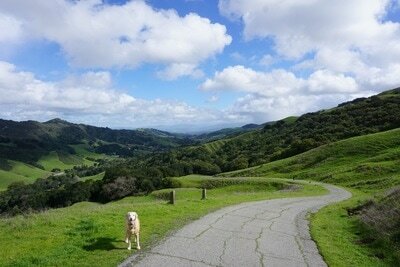 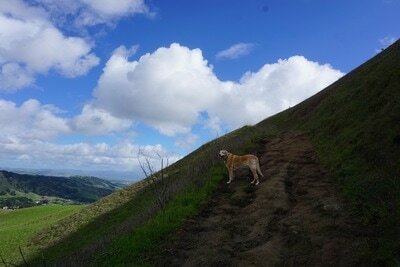 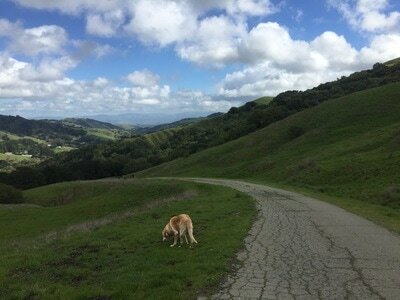 We continued to the peak at 1,800 feet, which offers views 360 degree views of the Bay Area. Look for Mt. 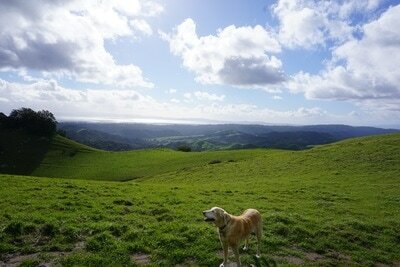 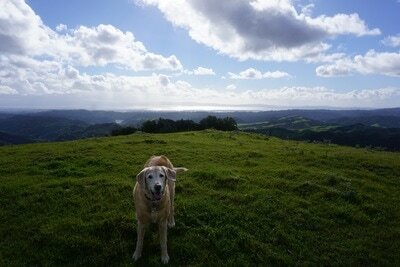 Diablo and the Carquinez Strait in the distance. 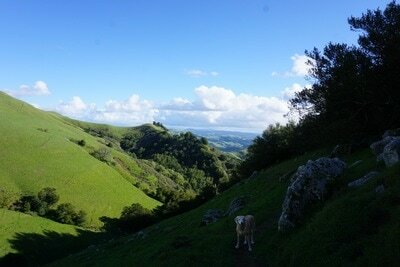 Next we retraced our steps to Sycamore Trail and headed down. 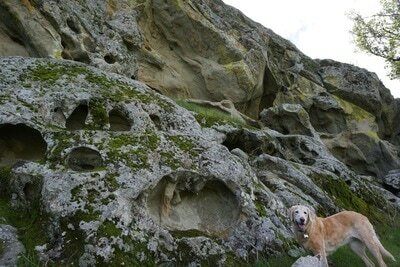 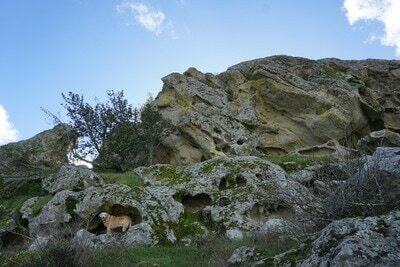 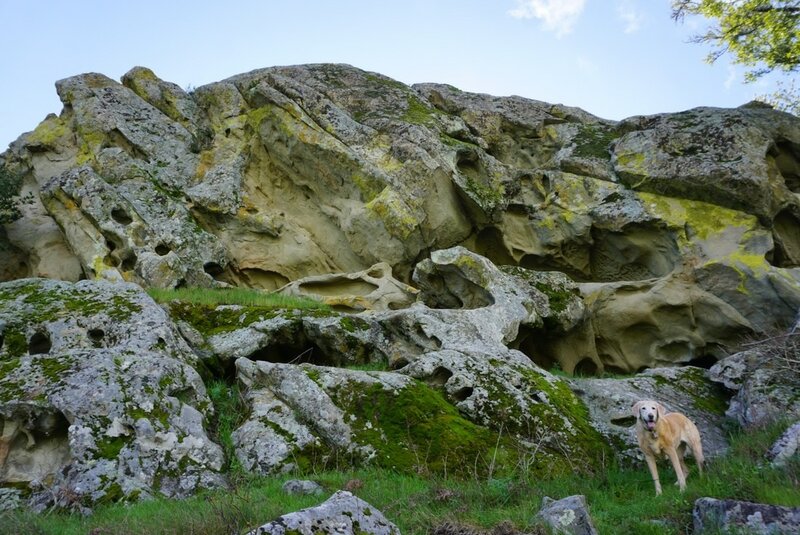 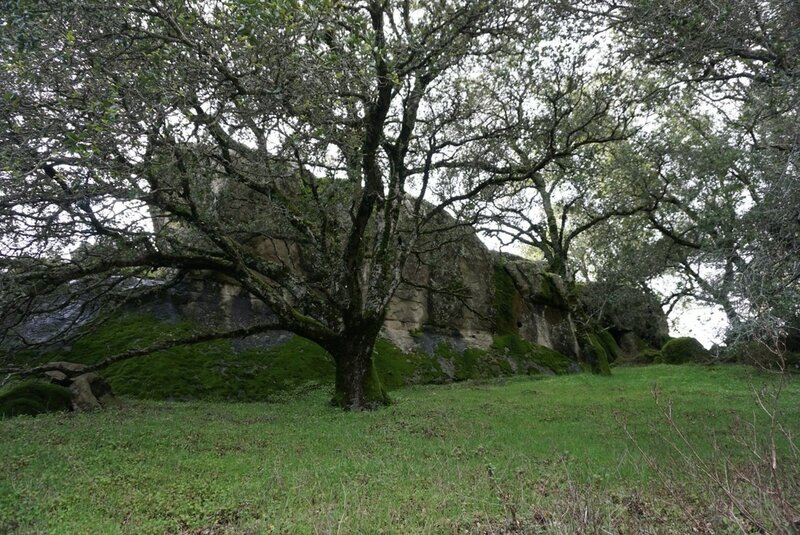 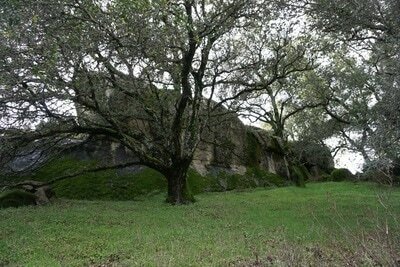 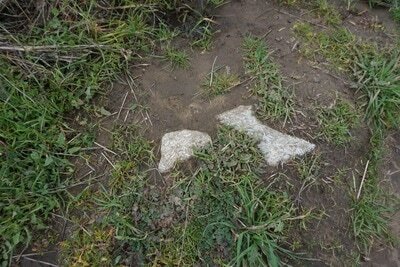 You'll soon see interesting rock formations along the EBMUD boundary. 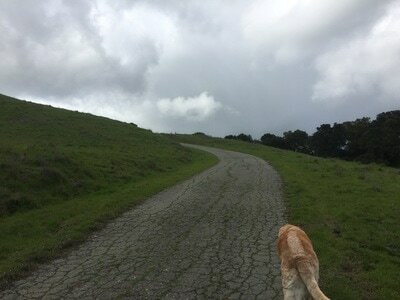 As you continue down, you'll notice the wind picking up. Look up and to your right and you'll see the wind caves. 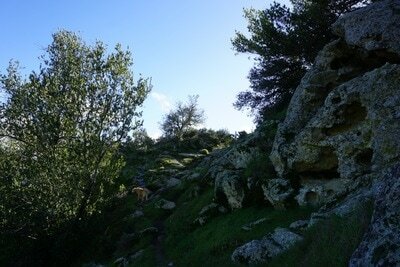 Getting to the main set of caves was strenuous, and required a sketchy scramble to the top. 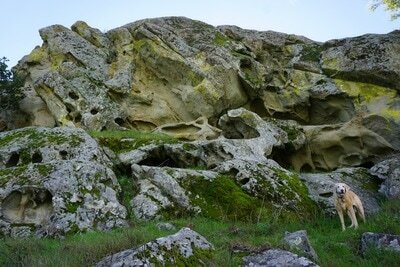 However, you can still view them from below or just continue to follow the trail down and it will climb up and over the large rock formation and you'll see a few small caves to your right. Sycamore Trail then continues down into the canyon, via a bushy, partly overgrown trail with multiple switchbacks. It offers great views as well and snakes down to a wooded, mossy area. We heard a waterfall to our left, which we could see the top of, but it didn't appear to be accessible. 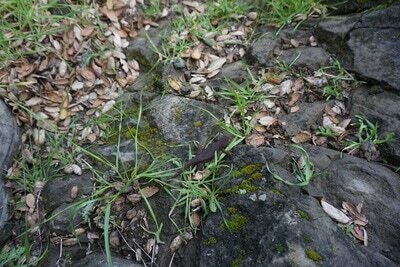 We did see some orange newts on the trail in this area. 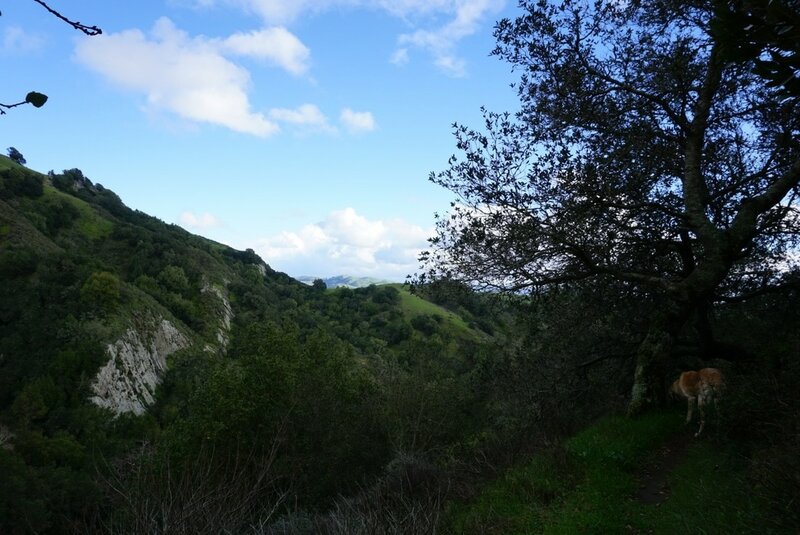 As it was getting late, we ended up turning around shortly before reaching Devil's Hole Trail, and retraced our steps back to the trailhead. Our hike was about 6 miles with 1,500 feet of elevation gain. Keep an eye on park closure times, as the main gate will be locked at that time. 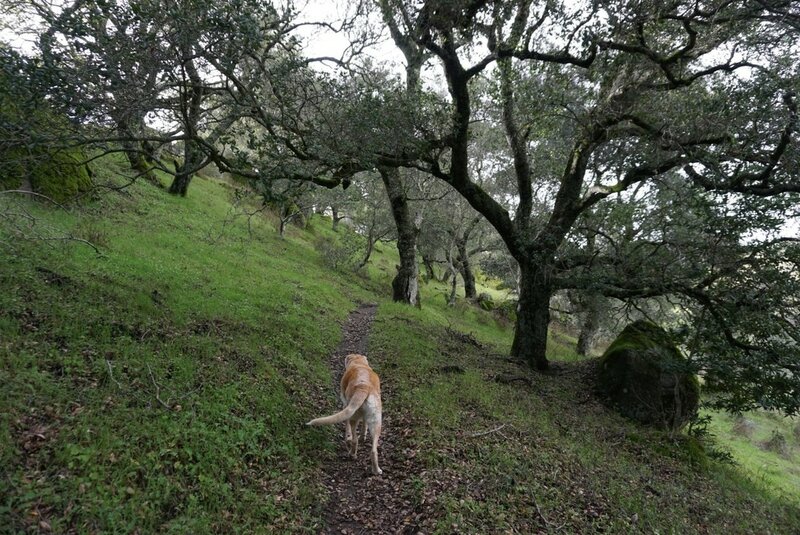 Pit toilets and trash cans available at the trailhead. 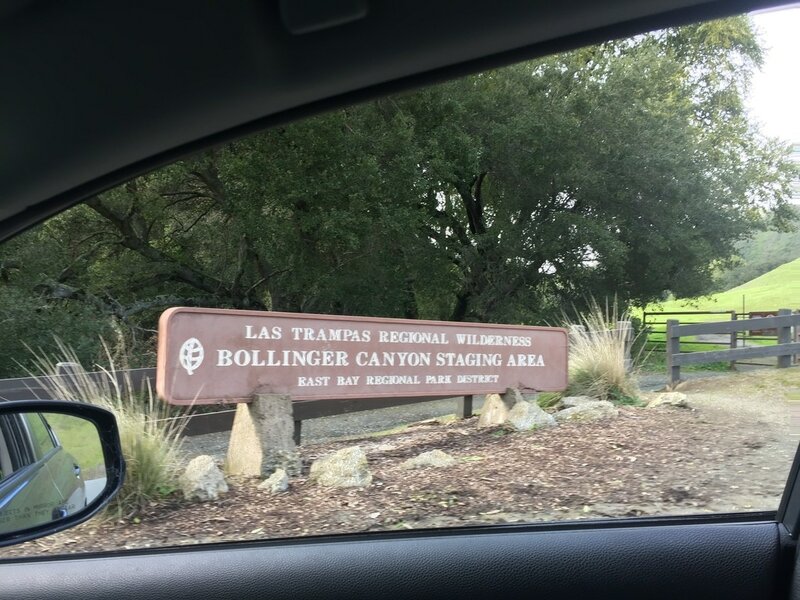 Bring plenty of water, as the water fountains were empty during our visit and no water was available in the park.